In 2010, Lucy and her long-term boyfriend John broke up. Three long, lonely years later, John returned to New York, walked into Lucy's apartment, and proposed. This is not that story. It is the story of what came after: The Wedding. DIY maven Lucy Knisley was fascinated by American wedding culture . . . but also sort of horrified by it. So she set out to plan and execute the adorable DIY wedding to end all adorable DIY weddings. And she succeeded. This graphic novel, Something New--clocking in at almost 300 pages of humor, despair, and eternal love--is the story of how Lucy built a barn, invented a whole new kind of photo booth, and managed to turn an outdoor wedding on a rainy day into a joyous (though muddy) triumph. Lucy Knisley is the author and illustrator of beloved graphic novels about memory, identity, food, and family. Her Alex Award-winning graphic novel, Relish: My Life in the Kitchen, tells the story of her childhood steeped in the food industry. It was a New York Times bestseller and has been translated into five languages. Her travelogues (French Milk, An Age of License, and Displacement) and web comic series (Stop Paying Attention) have been lauded by critics, and her combined work has built her a devoted readership for her honest and thoughtful true-life stories. 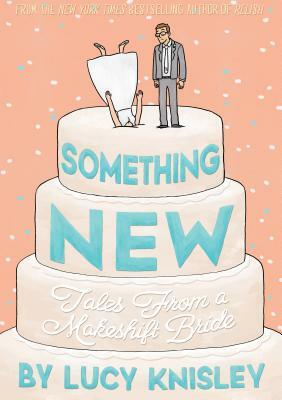 Her graphic memoirs include Something New: Tales from a Makeshift Bride and Kid Gloves.